A general contractor needed to core drill holes in the concrete to install new plumbing lines in a new construction site in Miami. The area that needed to be scanned, using ground penetrating radar, was a new construction project and was known to have critical structural steel in the concrete. Thus they contacted the specialists in rebar locating, Ron Anderson of GPRS. 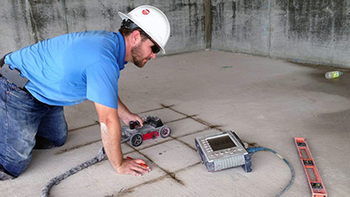 This application, rebar locating, is a common job for GPR. GPRS, LLC. in South Florida took the call and mobilized to the site. On site, GPRS was able to identify the structural rebar, quickly and accurately. They marked them on the surface of the ground and provided a report explaining the results. GPRS then collaborated with the general contractor, as to the depth and location of the structural rebar. The advantage to radar compared to X-Ray is that radar can locate the structural rebar from the surface of the ground, without dangerous radiation. The project was a success and why radar is “The New Way to X-Ray”. Locating steel rebar, post tension cables or electrical conduits in the concrete for the installation of plumbing pipes is a very frequent service performed by the GPR Project Managers at GPRS, LLC. Ron Anderson runs GPRS operations in the South Florida area. This includes Ft. Lauderdale, Miami, and the Florida Keys. He can be reached at (305) 801-4138 or by email at ron.anderson@gprsinc.com.